The main floor collides modern design with subtle cultural elements to bring together this beautiful space. This unit is exposed to high vehicle and pedestrian traffic and has prominent signage opportunities. 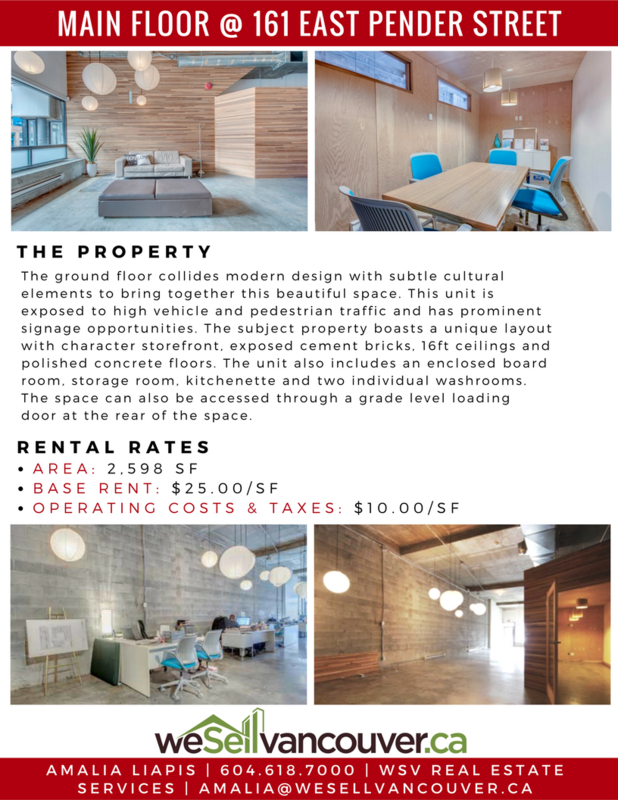 The subject property boasts a unique layout with character storefront, exposed cement bricks, 16ft ceilings, polished concrete floors and a brand new HVAC system. 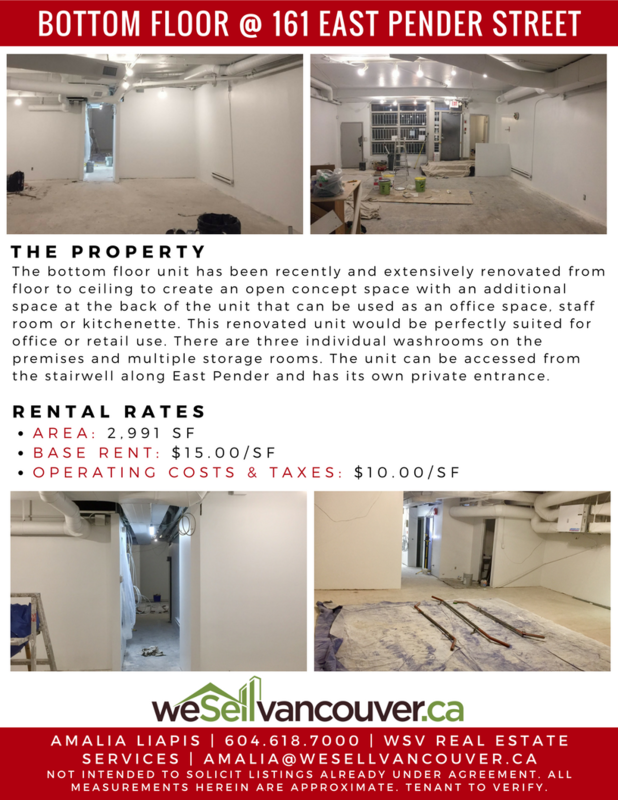 The unit also includes an enclosed board room, storage room, kitchenette, and two individual washrooms. 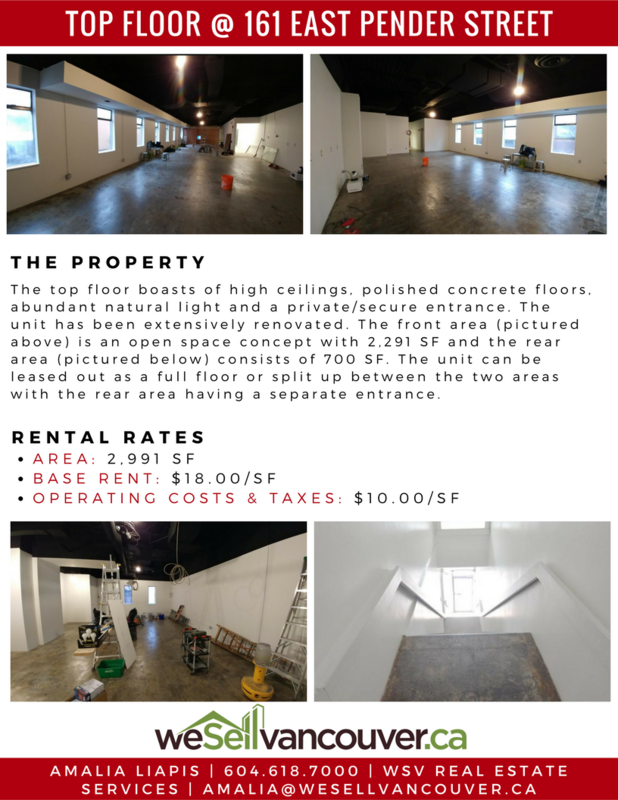 The space can also be accessed through a grade level loading door at the rear of the space. Contact Amalia Liapis at 604-618-7000 or Kane Ryan at 778-223-5961 for additional information. 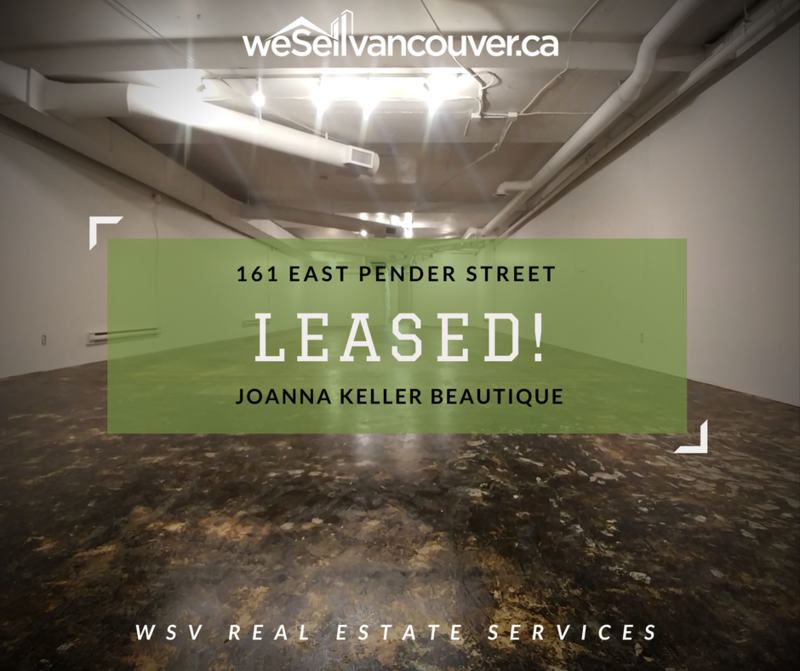 We're so excited to have LEASED a space for Joanna Keller Beautique, a beauty salon specializing in eyelash extensions, makeup application, hair styling and much more. We welcome you to the neighbourhood! 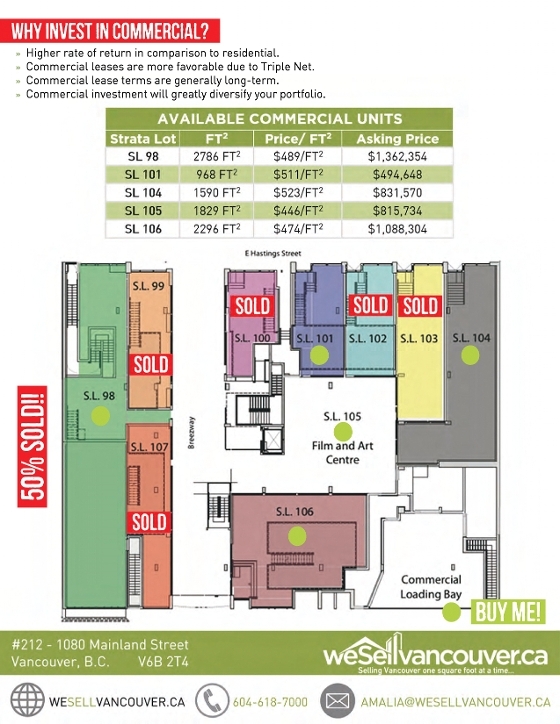 We still have the retail level and top floor available at the Silk Building. 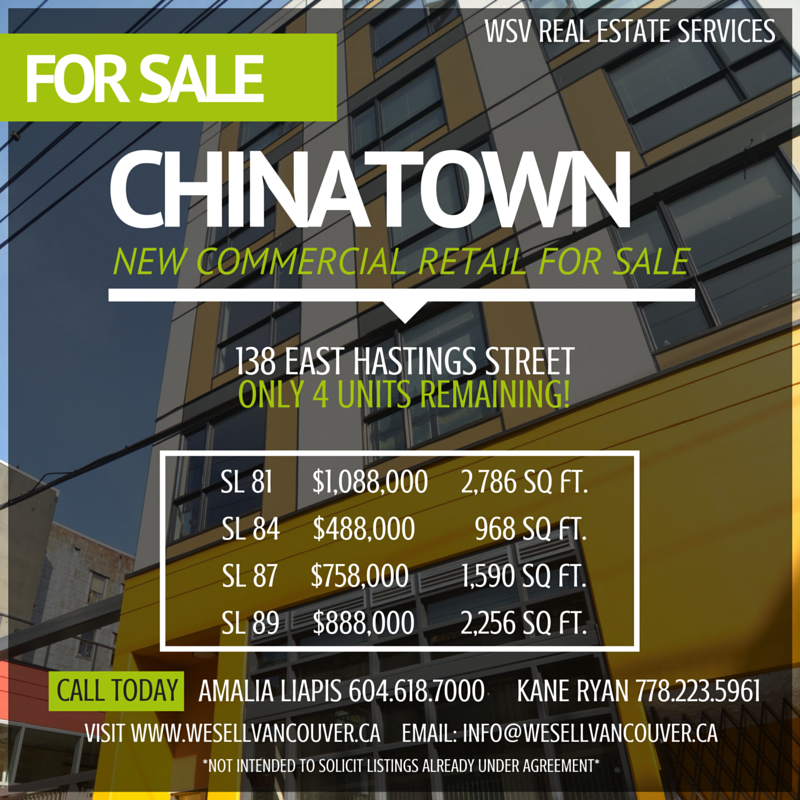 For all your commercial sales & leasing needs, contact us at amalia@wesellvancouver.ca or at 604-618-7000. We look forward to working with you in finding a space that perfectly suits your business needs! 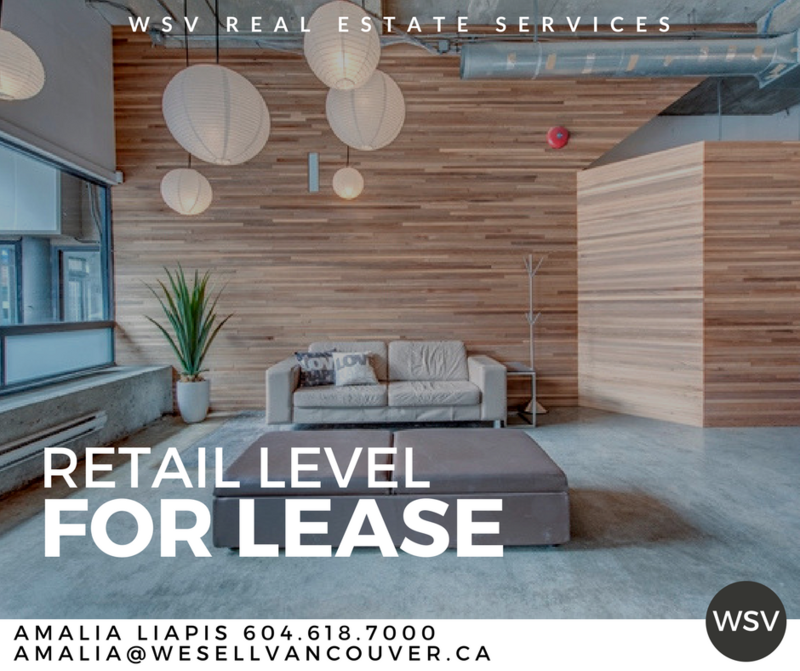 Contact Amalia Liapis at 604-618-7000 or alternatively at amalia@wesellvancouver.ca for showings or for additional details on the three properties listed above. 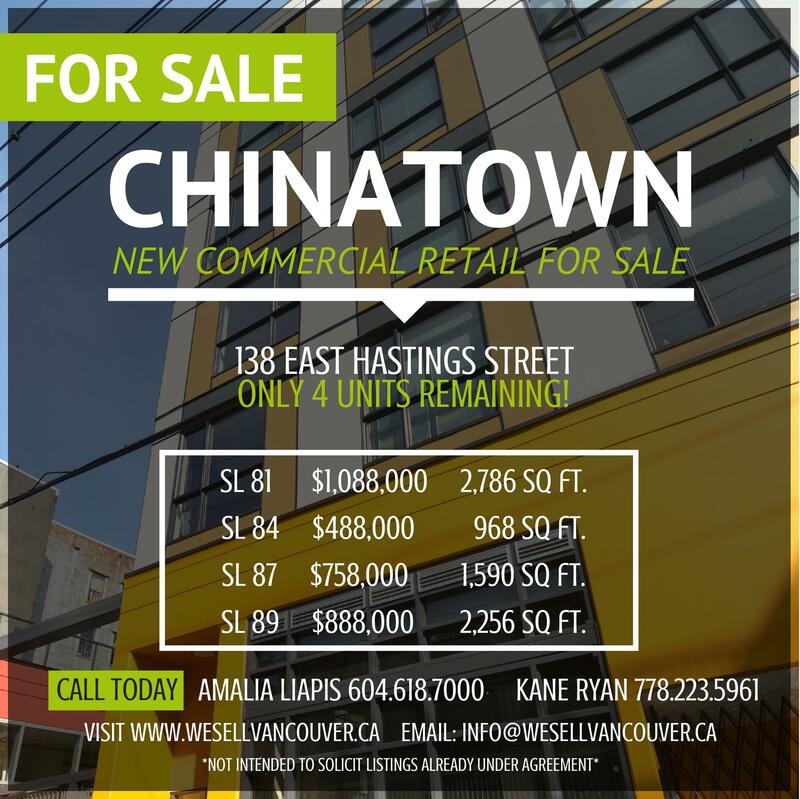 Grab a hold of this opportunity to invest in the revitalization of Chinatown. 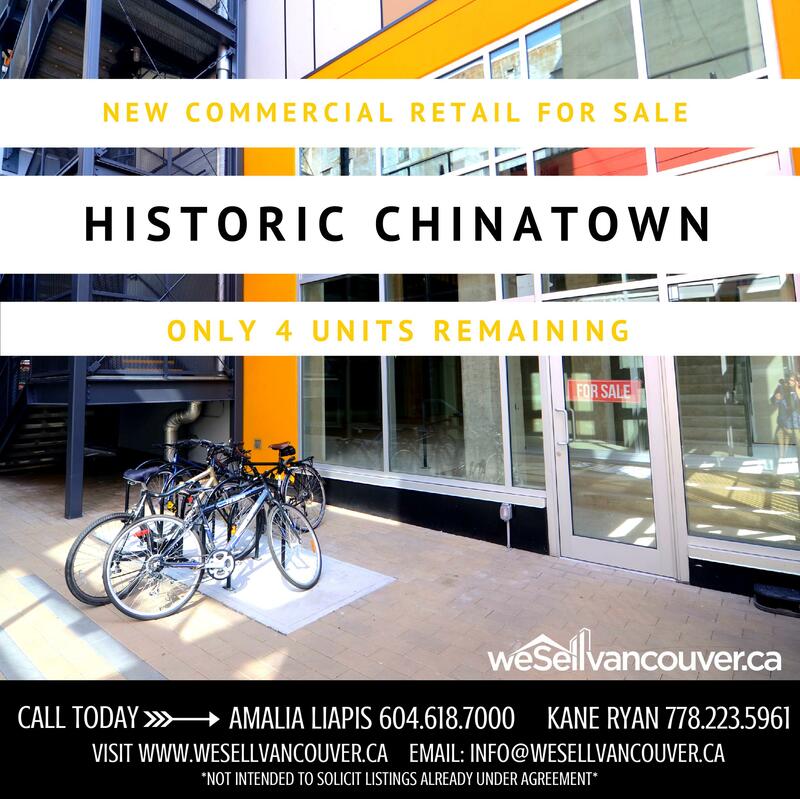 We have 4 great commercial units left with prices to match. Contact Amalia Liapis at 604-618-7000 or Kane Ryan at 778-223-5961 for more details! 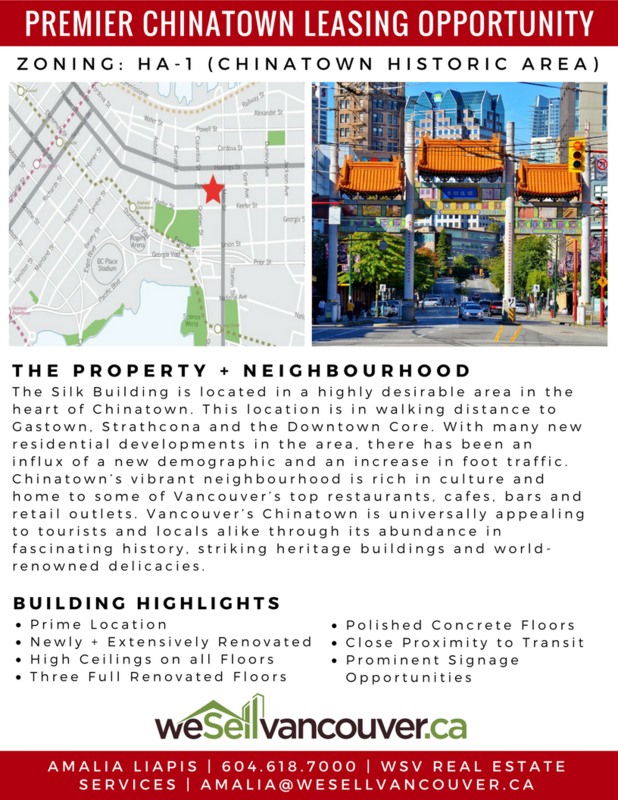 Want to be a part of the gentrification within Vancouver's evolving Chinatown? We only have 4 more brand new concrete and glass units available for sale. Contact us today for more details! Christmas may be over but the season for giving isn't and we're feeling generous this year. 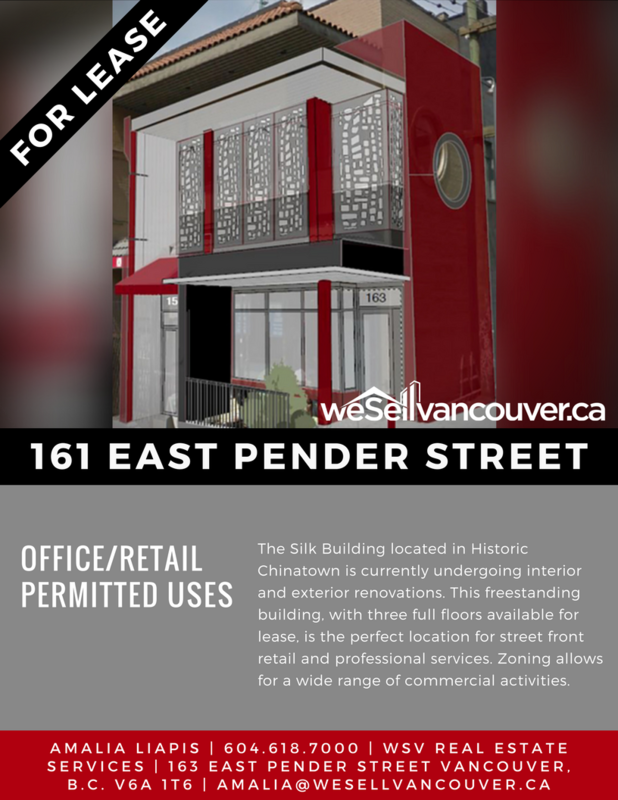 We're giving you the wonderful opportunity to invest in a revitalization movement within Chinatown. Don't just be a spectator in this movement, actively participate in it. 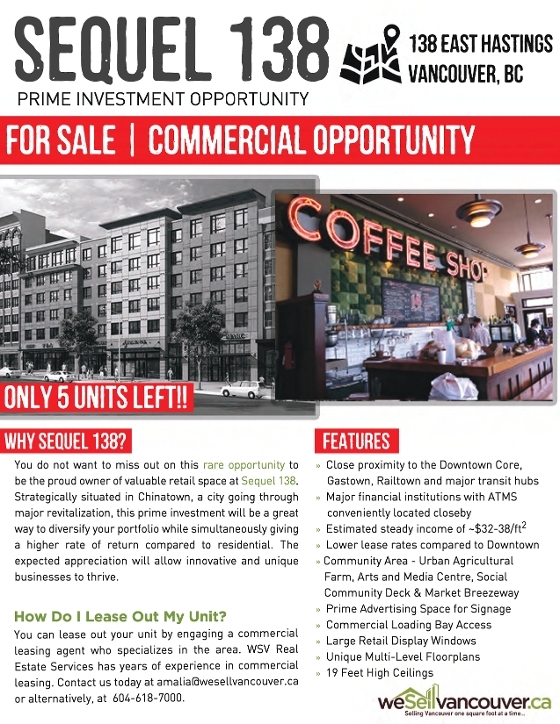 There are opportunities to invest in both commercial and residential units here at Sequel 138! We only have 5 commercial units available at unbeatable prices. 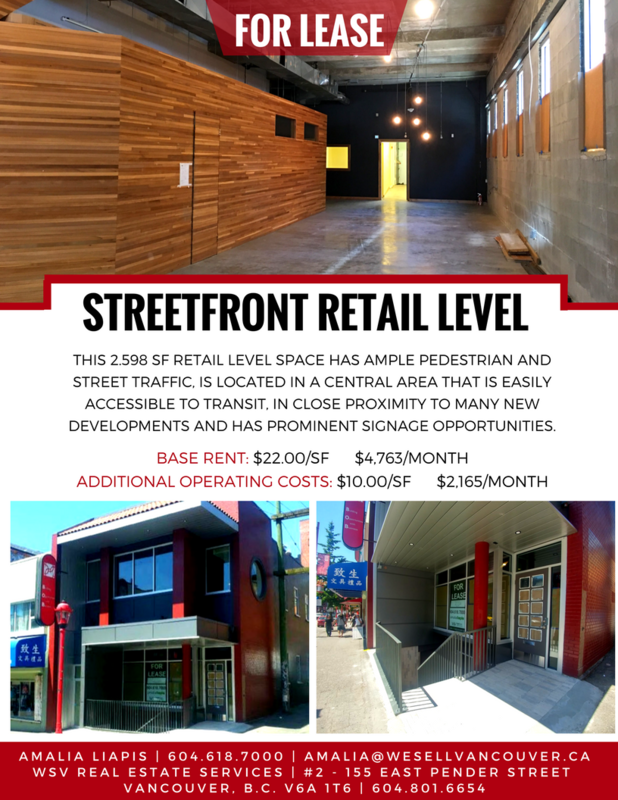 Want retail space with a downtown feel without the hefty price tag to match? Look no further. 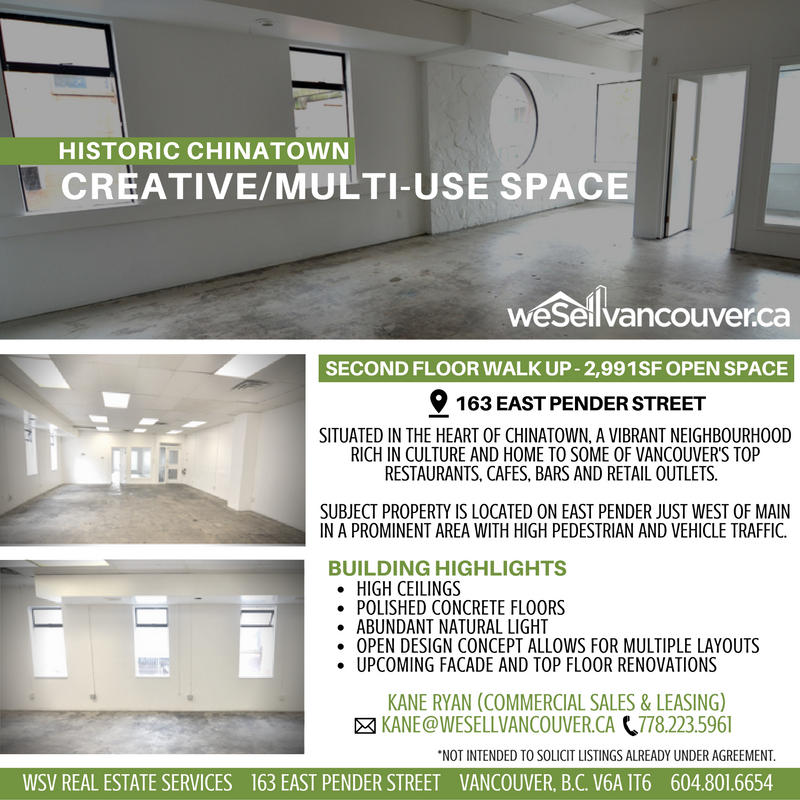 Sequel 138 is centrally located in the epicentre of Chinatown, Gastown, Railtown and Downtown Vancouver, making it convenient to access. This is an opportunity you do not want to miss out on. What better way to end off the year than with an investment that will add great value to your portfolio!